1. Combine condensed milk and all purpose cream. I usually prepare this before all the other preparations so I can put it in the fridge to chill. Chilled mixture means thicker filling. Thicker filling means more flamboyant ref cake. 2. Slice the mangoes. Use the really ripe ones. Scoop it out using a glass. That's very culinary school-ish, you know. Then slice it thinly. Make sure it's thin enough to put as filling and neat enough to put as topping. You can eat the buto before you proceed. 3. Make the first layer in a rectangular canister. I used the microwavable clear container that we can often buy at the supermarket. Or the usual size of a baunan. It can hold two pieces of graham crackers. Just snip-off the corners to fit it nicely. 4. File the mango slices. Do not put one atop another. It should be side by side, but not siksikan. They're not sardines, they're fruits. 5. Pour the sweet cream mixture. Use a spatula to spread it to the entire crackers crust. But if it's not as thick as I assumed it to be, then it'll just automatically and freely go to wherever corner it wants to go, like a hot lava from the volcano. Bulwak galore. Hihi. So make it thick, muther. 6. Repeat until you made three layers of graham crackers. 7. Here's the artistic part. Pour the cream mixture first, spread with a spatula, then layer your sliced mangoes according to how you want it to look. Then crush some graham crackers and sprinkle on top for more landi. 8. DO NOT PUT IN THE FREEZER. Best to have it chilled just along with the water, eggs, etc. I was a pushy kitchen novice then that I thought the freezer will make the chilling faster, so we could eat it right away. It did. But when the ice melts, the creamy mixture went pfft - as in watery yuck. 9. Slice it like a virgin, as in mahinhin, for better plating. 10. Take a photo, post on Instagram, tag me, pray then gear up to gormandize! 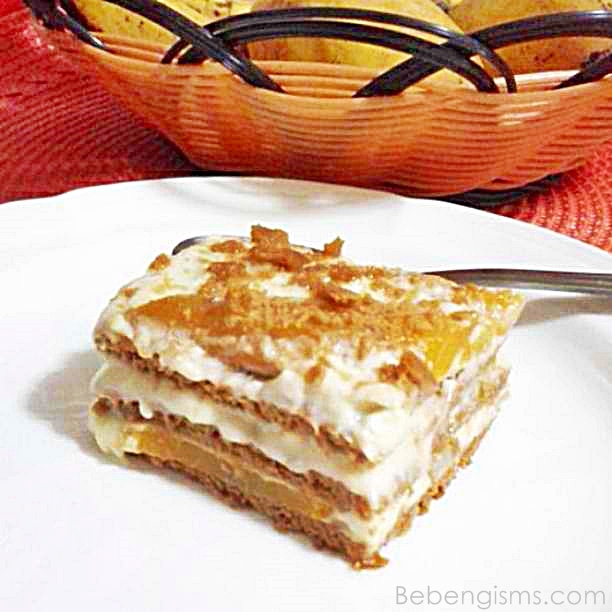 Mango float pala tawag dito, I've tried doing this before so medyo navvisualize ko yung steps mentioned. What's new to me is the 'scooping with a glass' part. Chaka oo nga, niresearch ko pa talaga meaning ng 'gormandize' - to eat greedily. haha ang lalim.